Huntington Beach, CA, September 14, 2018 – This year, Surf City Surf Dog® is celebrating a decade of dog surfing and fundraising for pet-related charities! The 10th&nbsp;Annual Surf City Surf Dog® competition will take place on September 29th at Huntington Dog Beach, which is also celebrating its 20th anniversary. The world’s best surfing dogs will once again gather in Surf City USA to compete for barking rights, trophies and prizes. &nbsp;Over the last ten years, more than 500 dogs have participated in this unique sport, hailing from the UK, Australia, Canada, Brazil and all corners of the United States! The weekend-long celebration will showcase the best in dog surfing, pet adoptions, and pet social activities while providing engaging beach activities for the entire family to enjoy. The main event, the dog surfing competition is on Saturday, September 29th at Huntington Dog Beach from 8:00 am to 2:30 pm. The contestants will compete in Shredder/pro heats, owner and handler weight-class divisions, as well as a tandem heat&nbsp;and Stand Up Paddle heat. The surf dogs will be judged by professional surf judges on a variety of skills, including the length of their ride and difficulty of wave and maneuvers.&nbsp; All dogs are winners and will receive a commemorative participation medal, though trophies will be awarded to the top dogs in each category. The event ends with closing ceremonies and award presentations.&nbsp; It is free to spectate and there is a complimentary McKenna Shuttle from City Hall (200 Main Street, Huntington Beach) to Dog Beach (100 Goldenwest Street and Pacific Coast Hwy). In conjunction with the McKenna Subaru Surf City Surf Dog Event, the weekend kicks off with an Opening Ceremony/Pooch Pawty on Friday, September 28th at the Shorebreak Hotel located at 500 Pacific Coast Hwy in Huntington Beach.&nbsp; There will be fun interactive photo booths, pawtographs by famous surf dogs, costumes and more. Surf City Surf Dog® is the second event of Surf Dog Events’ two-part series. 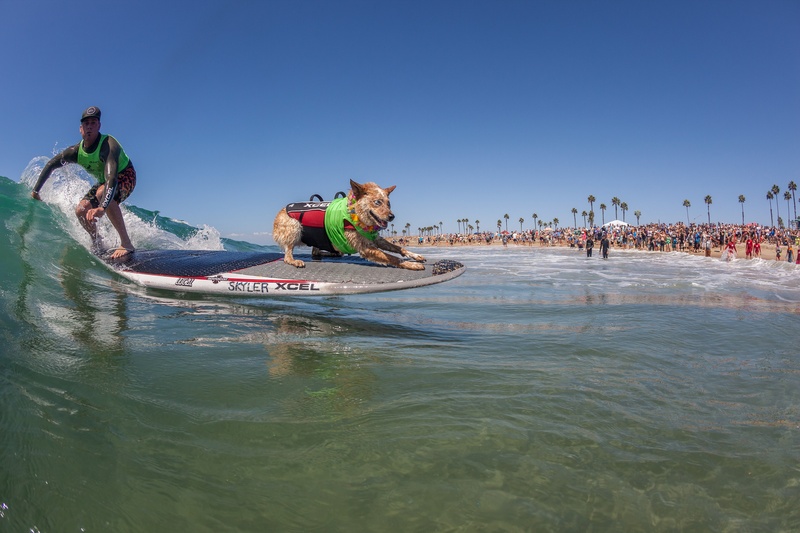 The first Surf Dog event took place in Imperial Beach this past July. Official partners of this year's Surf City Surf Dog® event include McKenna Subaru, CBS2/KCAL9, &nbsp;The Residences at Pacific City, Only Natural Pet, Just Food For Dogs, Rufus and Coco Natural Australian Petcare, Bark! Bark! and Outward Hound. For more information or to register, please visit SurfDogEvents.com. Follow us on social media @surfdogevents on Instagram and Twitter and on facebook.com/surfcitysurfdog.